Event Capital, a Laqshya Media group company, and Truly Musical have announced their collaboration with Hungama and Škoda Auto for the 4th season of Bollywood music festival – Hungama Bollywood Music Project. This is Hungama’s third association with BMP as the title sponsor. Škoda Auto collaborated with BMP as they believe in adopting clutter breaking ways and means to not only deliver a great product but an interesting way to reach out to the audiences with launches lined up this festive season. The Hungama Bollywood Music Project 4.0’is scheduled for 20th and 21st October in Mumbai at the Jio Gardens, BKC. Showcasing the largest Bollywood music talent under one room, the two day festival will be a treat for every Bollywood fan offering an eclectic mix of music with various “experiential” zones and fan-engagement pockets, making Hungama BMP 4.0 an experience to remember. And not just that, this festival is a great a juxtaposition of Music, Entertainment, Food & more! Škoda Auto presents Hungama Bollywood Music project season 4.0 in association with MTV, powered by Sai Estate, Style Partner Spykar and co-sponsored by Nissin Cup Noodles. The two day festival curates experimental Bollywood Music through Bollywood’s biggest headliners for the audience who thrives on all genres of Bollywood music. 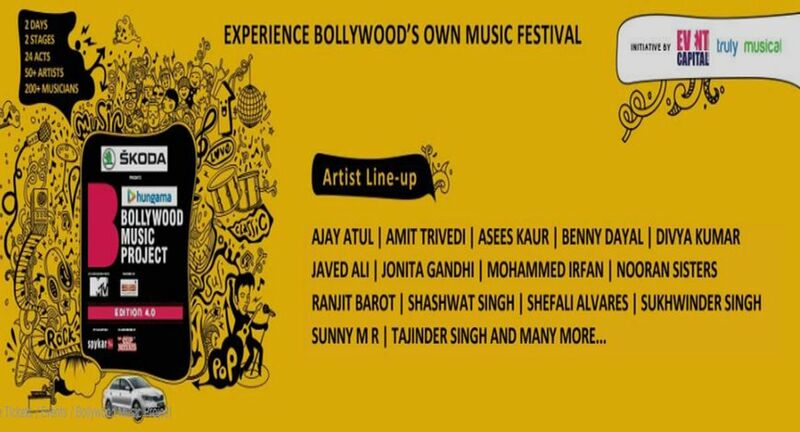 This year the Phase 1 and Phase 2 line-up announced revealed Ajay-Atul as headlining act for Day 1 and Amit Trivedi headlining Day 2 amongst other popular artists like Javed Ali, Asees Kaur, Benny Dayal, Divya Kumar, Jassie Gill, Babbal Rai, Mohammad Irfan,Akanskha Bhandari, AnirudhBhola, Charu Semwal, Digvijay Singh Pariyar, Goldie Sohel, Harish Moyal, Humsufi, Jonita Gandhi, Nikhita Gandhi, Nooran Sisters, Ranjit Barot, Shashwat Singh, Shefali Alvares, Sukhwinder Singh, Tajinder Singh and Zublee Baruah.